The beach is one of the biggest draws for the thousands of people who make their way to Edisto every year for two reasons: fun and food. Anyone whos been to Edisto can attest to the hours of fun that can be had on the beach itself where visitors can lay out, play a game of volleyball or bocce ball, swig down the southern staple known as sweet tea, and walk in the surf. But all thats nothing compared to one of the best things offered by Edisto Beach  the shrimp swimming in all the salt water surrounding the island. Hands down, Edisto shrimp are the best in the world. Theyre miles above the frozen pink bodies placed grotesquely around a ring and found in your local grocers freezer. Edisto shrimp are juicy, meaty, and full of flavor. Theyre perfect for a peel-and-eat meal or as a part of a recipe. One of the perfect shrimp recipes any Edisto vacationer should try is a classic southern dish: shrimp and grits. Some people unfamiliar with grits are quick to turn away from the creamy corn-based and buttery goodness, but traditionally prepared grits are irresistible, so combining grits and shrimp is a win-win situation. So how do you enjoy Edisto’s famous pair? Well, when on Edisto you must stop by the Sea Cow and place an order. It’s hard not to find good Edisto shrimp while dining out here so check out our restaurants page for menus. Back home or in that beach house kitchen, try creating your own dish. Our favorite recipe is listed below so give it a shot or share yours at the bottom of this blog post. Bring water in a pot to a boil and blend in the grits and salt. Reduce the heat to a simmer and cover. Let cook for 30 minutes with occasional stirring. Then blend in the milk and cream and set aside. On medium heat sauté the butter and sprinkle in the parsley and shrimp. Season with the garlic salt and lemon pepper. Blend in the ketchup and shooting sherry and simmer for 2-3 minutes. When the shrimp turn red they are done. Serve the shrimp over grits and enjoy. 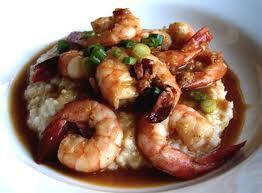 Good Recipe now my question is where on the island is the best place to try Shrimp and Grits?